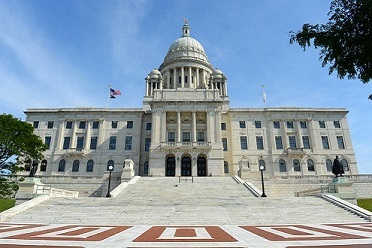 Serving over a million notaries nationwide since 1940, we have been assisting notaries in Rhode Island for many years and have everything you will need for your Rhode Island notarial practice. Tradition of Trust & Integrity Empowering Rhode Island Notaries. We are your primary provider source for all your notarial and supply needs. Fax, mail, email, call or place your order online today. If you are a new or renewal notary we will expertly guide you through the entire process. We offer a full selection of discounted notary stamps, notary certificate stamps, notary impression seal embossers and supplies for Rhode Island notarial services. Our Rhode Island Notary Impression Seal Embossers have exceptional impression quality that leave a clear, raised and sharp impression every time. All impression seal embosser's measurements fully comply with state statutes. Our Rhode Island Rectangular Seal Stamps are made of high-quality materials and have outstanding impression quality. All stamp measurements fully comply with state statutes. Our Rhode Island Round Seal Stamps are made of high-quality materials and have outstanding impression quality. All stamps measure 1-1/2" in diameter and fully comply with state statutes. Be a registered voter in the State of Rhode Island, or an attorney (resident or non-resident) who is a member of the Rhode Island Bar, or a resident or non-resident Rhode Island Certified Public Accountant. Optional. Notary Service and Bonding Agency, Inc. strongly recommends that Rhode Island notaries insure themselves against claims of negligence. Executive Order 09-08 encourages notaries public to use a notary seal. The seal should produce a sharp, legible, embossed or printed image that legibly reproduces under photographic methods. The seal should include the notary’s name exactly as it appears on his or her notary commission and the words “NOTARY PUBLIC” and “RHODE ISLAND.” A notary seal must not contain the State Seal of the State of Rhode Island. None Required. It is strongly recommended by Executive Order 09-08, the Secretary of State, and Notary Service and Bonding Agency, Inc. that Rhode Island notaries record every notarial act in a permanently bound journal. A filing fee of $80 is required for new and renewal notary applications. Permitted. Under Section 5-3.1-5, members of the Rhode Island Bar and certified public accountants shall, regardless of residence, be appointed a notary public commission if they apply and present a certified copy of a certificate of admission to the bar or a certificate of public accountancy. A notary public may apply 60 days before the expiration of his or her commission by completing a renewal notary application form. Complete and print the Rhode Island notary public application and mail it along with a filing fee to the Secretary of State. Continue here to complete and print the Rhode Island notary public application. Important note: If the notary public section approves your notary public application you will receive your notary commission in the mail in approximately 3 weeks. Your term will expire four 4 years from the date of commission. A renewal form will be mailed to you at the address listed, so please contact the office if you change your address. Receive your notary commission information from the state and you will be able to order your notary supplies by fax, email, phone, mail or online. Once you receive your notary commission information from the state you will be able to order your notary supplies. Contact us or proceed to the secure shopping store to complete your order. Only after receiving your notary commission information and obtaining your notary supplies should you perform notarial acts for the State of Rhode Island.